Cathie Filian: Fourth of July Craft Project ! Fourth of July Craft Project ! 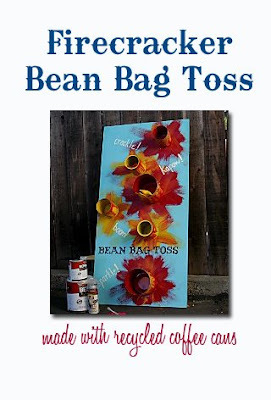 Step right up for a classic bit of carnival fun: the beanbag toss! The homemade version of this famous game is easy to make and a blast to play. 1. Prime and paint the plywood with latex semigloss paint. Lay out the coffee cans and draw a pencil outline where they will be placed along with their point value. Smaller cans placed farther from the thrower should have higher point values, and larger cans placed closer to the thrower should have lower points. 2. Remove any labels from the cans; spray-paint the cans inside and outside with paint designed for metal. Pencil the point values for each can on its inside edge. Use DecoArt metal paints and a small paintbrush to paint the point values and to add details, such as flames. 3. With 2" paintbrushes, dry-brush red and yellow craft paint flames around each plywood pencil circle. Let the paint dry, then add lettering, such as "kapow!" and "boom!" 4. Wearing gloves, wet the can bottoms with a wet sponge. Apply Gorilla Glue to the bottoms of the cans and place each can on the appropriate plywood outline. Place the cans with the point values facing the bottom of the board where the thrower will stand. Weigh each can down with a heavy book or other weight until the glue has dried. 5. Using pinking shears, cut six 3"x3" felt squares (to make 3 beanbags). 6. Pin two felt squares together and stitch around the outer edge, leaving an opening on one side for filling. Fill the beanbag with beans and stitch closed.